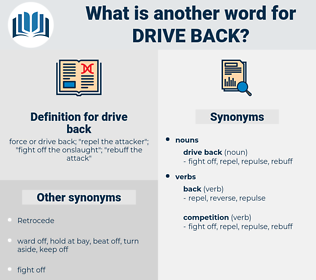 What is another word for drive back? 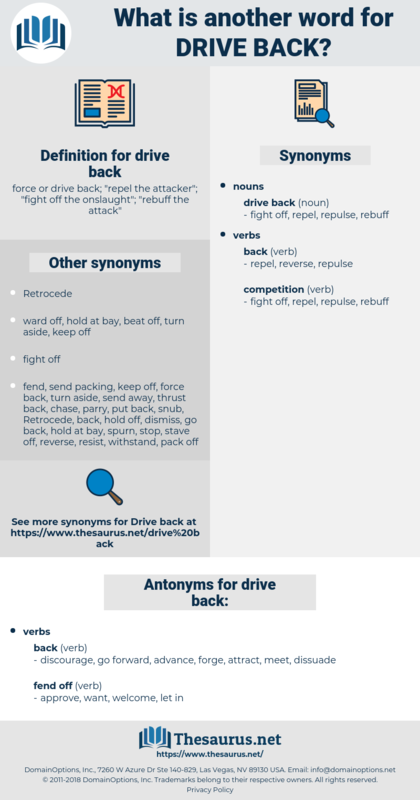 force or drive back; " repel the attacker"; " fight off the onslaught"; " rebuff the attack"
discourage, go forward, advance, forge, attract, meet, dissuade. approve, want, welcome, let in. allow, accept, support, increase, sanction, draw, aid, assist, agree, help. dreyfus, drop-kick, draw back, dwarf oak, drawback, dervish, dwarf pipefish, drippage, dropsy, drypis, Drupaceous, dwarf buckeye, drop back, dropkick, dwarfish. fight, oppose, fight down, fight back, defend.